The release of the Sony Android TV IP driver lets you integrate Sony Android televisions with the Clare Controls Network. 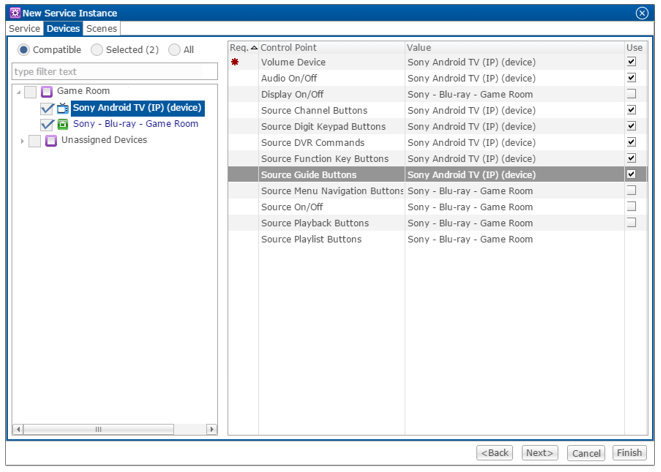 Customers can now control their Sony Android TV through IP using the Clare Controls Application. No software or download is necessary. Simply connect the Sony TV unit to the home network, and then add the TV in Fusion. Note: The following models are supported, additional models may be compatible but have not been tested. Note: The selected Sony Android TV must support Remote Start. This feature is found in the TV setting’s menu. Only qualified technicians should install or connect any devices used with Clare Controls products. Refer to the installation instructions that came with your Sony Android TV. Clare Controls does not assume any responsibility for damages caused by improper installation or connection to the data network. Note: A static IP address must be set for the Sony TV. 1. Access the TV’s User Interface menu, and then browse to Remote Start. 2. Set the Remote Start option to On, enabling the TV to be turned on while in standby mode. Note: If you are using a newer Sony D series TV, enable Simple IP Control. 1. Access the TV’s User Interface menu, and then browse to Simple IP Control. 2. Set the Simple IP Control option to On, enabling the TV to be turned through IP control. 1. 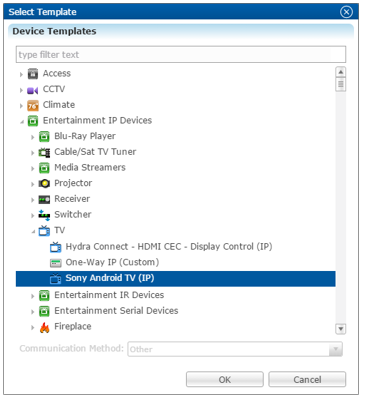 Access the Sony TV’s User Interface menu, and then browse to Network Setup. 2. Select Expert, and then WiFi or Wired LAN. If you select WiFi, it prompts you to select the WiFi network. If you select Wired LAN, it connects to the network automatically. 3. Select Advanced, and then IP Setting. 4. Set the IP Setting to Static. 5. Enter an IP address, and then click Next. 6. Enter the Gateway, and then click Next. 7. Enter the Network Prefix Link (6 or 24), and then C=click Next. 8. Enter the DNS1, and then click Next. Note: If you do not know the DNS, you can use the Google DNS 8.8.8.8 and 8.8.4.4. 9. Enter the DNS2, and then click Next, the IP settings auto save. 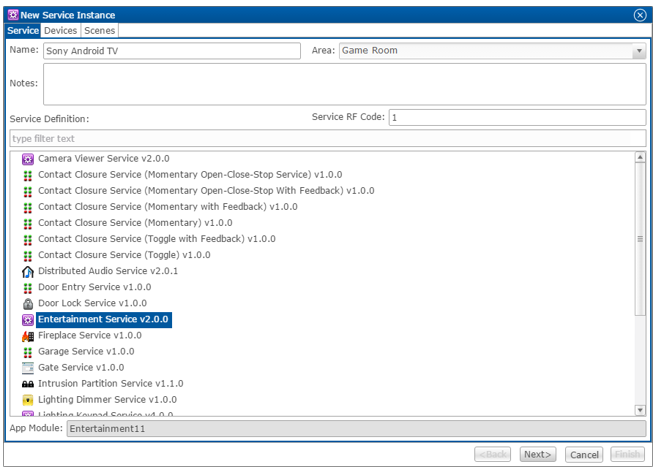 Configure the device in Fusion to enable the Sony Android TV to function with the Clare Controls UI. 1. Open your Fusion project. 2. Click the Devices tab, and then click the New Device button. The Select Template dialog displays. 3. Browse to Sony Android TV (IP). The device Details tab displays. If desired, enter a name and notes for the device. 5. Click the Configure tab, and then enter the Network Address and verify that the Network Port is set to 20060. 1. Click the Services tab, and then click the New Service Instance button . 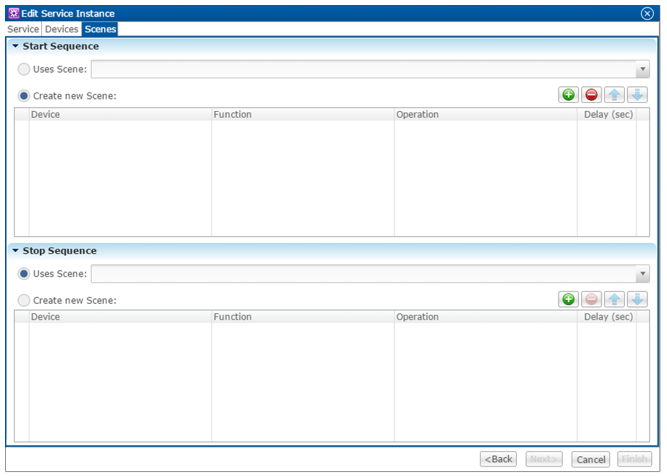 The New Service Instance dialog displays. 2. Enter the name of the service in the Name field, select the area, and then click Entertainment Service. 3. Click Next to display the Devices tab. 4. In the left panel, select the devices you want to use in the service. 5. In the right panel, set the values for each control point. Click the Value field to view the drop-down menu and select a device. 6. Click Next to display the Scenes tab. 1. In the Start Sequence field, select Create new Scene, and then click the New Device Operation button. 2. 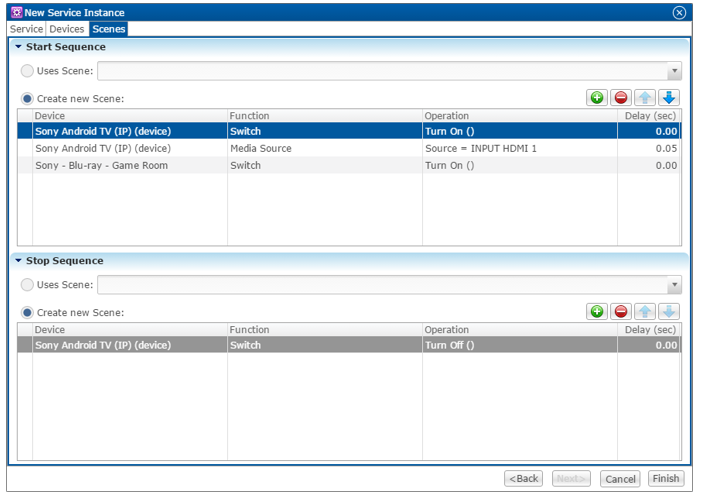 Configure the Device, Function, and Operation drop-down menus with the following values. 3. Repeat steps 1 and 2 for each device being used in the scene. 4. Go to the Stop Sequence field, select Create new Scene, and then click the New Device Operation button. 5. 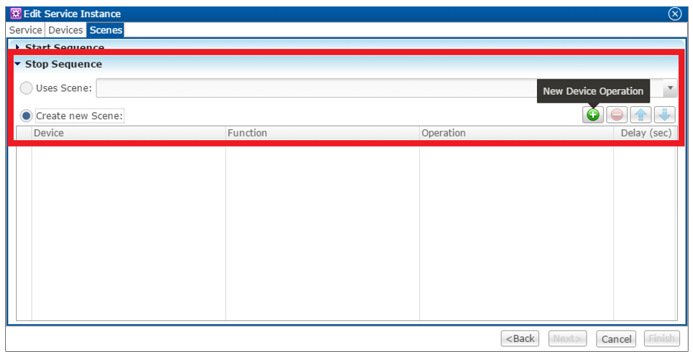 Configure the Device, Function, and Operation drop-down menus with the following values. 6. Repeat steps 4 and 5 for the other devices that you are using.